Looking for an easy full day adventure in the Hakuba area? Then a hike up to Happoike or Happo Pond is just perfect. It is not a strenuous hike as the gondola and chairlifts will provide you a lift and you can enjoy the short hike to Happo Pond at a leisurely pace. This hike will give you breathtaking views of the Hakuba basin and the North Japan Alps or Kita Alps provided the weather cooperates. This hike is popular during warmer months so chances are you will be enjoying the view with other hikers. 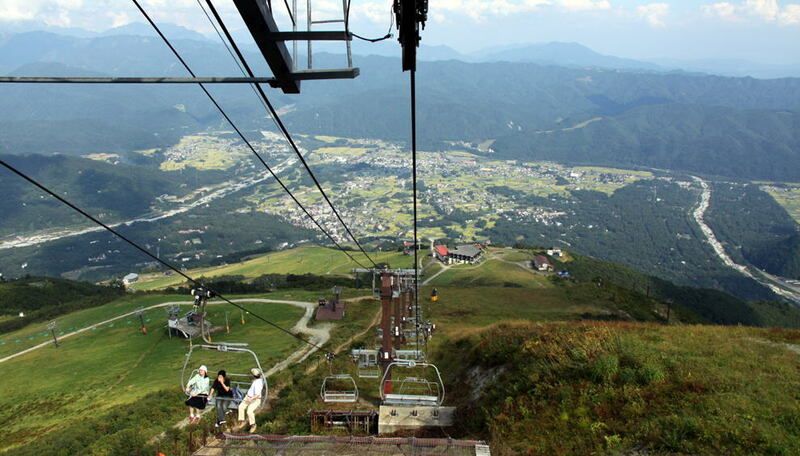 Start your journey from Hakuba Village which is usually the access point for countless trails up the North Japan Alps. Head to Happo Gondola Lift Adam Happo Station which is a 10-minute walk from Happo Bus Terminal. The Gondola will take to you up to Usagidaira where you can change to the chairlifts Alpen Quad and Grat Quad respectively. The chair lifts will allow you to enjoy the fresh alpine air and enjoy the unobstructed nature views. The highest point accessed by the chair lift is at 1831 meters and where the mountain hut Happouike Sanso is located. The real hike starts from here. It is a combination of rocky path and boardwalk. If climbing in June there might still be some snow left. During summer, you will be able to see the alpine plants along the trail. You can take a leisurely hike and depends on your pace you will reach Happo Pond at 2100 meters elevation after an hour and a half or less. At Happo pond, you will be able to gaze at the majestic Hakuba peaks; Shirouma Yarigatake, Shakushidake, and Shiroumadake. They will seem really formidable from this vantage point. But the real draw of Happo Pond is when the weather is clear and not windy. On the still surface of the pond, you can see the perfect reflection of the Hakuba peaks. This is one of the best views in the Northern Japanese Alps. The weather up in the mountains changes quickly so enjoy the chance while you have it otherwise you will have to go back again. If you are in for a multi-day hiking you can continue on to Karamatsudake at the elevation of 2696 meters along the same trail. From Karamatsudake, you can either head south to Goryudake or to the north all the way to Shiroumadake. Or you can head back down to Hakuba village for a soak at one of the onsens. A Budget Travel Experience in Chiba!